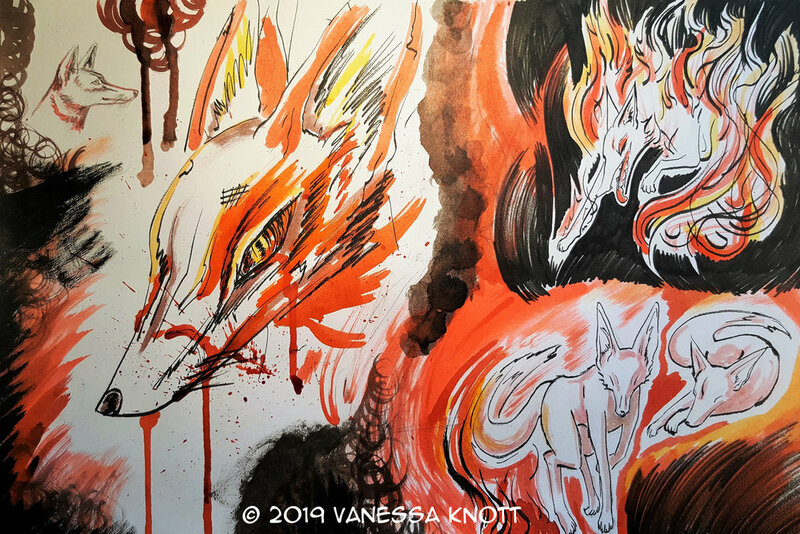 Let's Talk Process — Michael Mitchell Jr.
Let's Talk Process with illustrator Vanessa Knott! Hi, I’m Michael, and welcome to Let’s Talk Process, Issue No. 2! Thanks so much for joining me for the second issue of my ongoing artist interview series. You can read more about me here. My goal for this series is to dig deeper and explore how various creative people specifically approach their daily work. With that in mind, the questions for Let’s Talk Process center around the unique creative processes of artists & authors, how and when they work, routines, and inspirations. This issue, I’m thrilled to have UK illustrator Vanessa Knott as my guest! Hi, Vanessa! To start, tell us a little about yourself and your art. Hello! I’m an illustrator living in the South East of England, UK. I specialise in fantasy and mythological creatures using traditional mediums such as inks and watercolours. I also create fan artworks from popular sci-fi, fantasy and video game franchises. 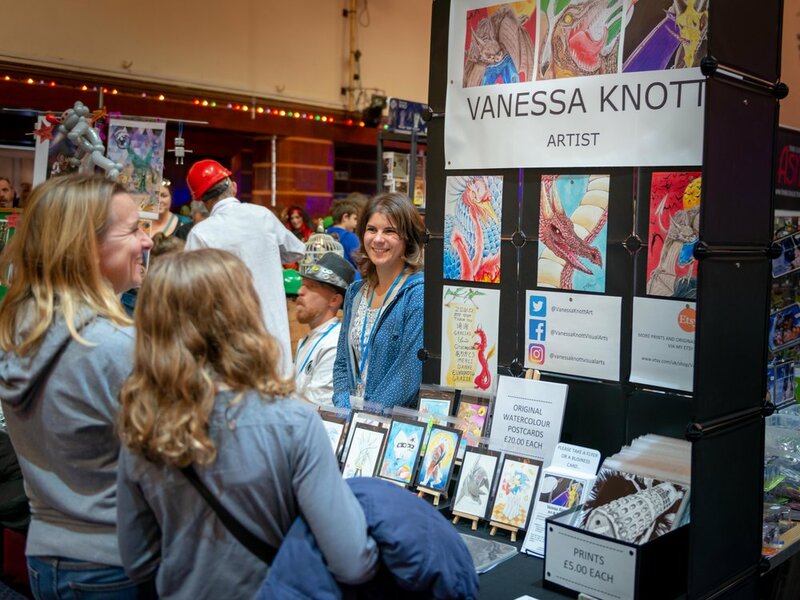 To date, I have exhibited and traded at four comic cons, where I have sold my prints and original watercolour drawings. Describe your creative schedule. When do you work on art? What does your normal daily routine look like? I have no fixed creative schedule. If I could, I would love to be a freelance illustrator, but at the moment, I work part time with a rota that alternates each fortnight. It can therefore be tricky at times to get a good creative routine going, especially with other commitments, but that’s not to say that it’s always difficult to do so. It’s just a matter of good time management. I try to create time for myself and minimise distractions. If it’s a work day, I simply draw in the evenings. If I have a day off with no other commitments, I love focusing on my art for most of the day. Do you think there are certain times of day that are more conducive to your creativity? I find the actual act of creating encourages creativity, as opposed to a specific time of day having an influence of levels of creativity. Inspiration can strike you at any time depending on what you’re doing. I could be taking a walk through the woods, visiting an exhibition or reading a book when a good idea starts to form in my mind. It’s a way of feeding your imagination. It’s good to have a sketchbook and pen at hand just in case you want to jot down something or scribble out a monster. However, if I had to analyse my work pattern then I would say I’m at my most productive during the evenings, simply because there are fewer distractions at that time of day! I can focus on my art and the act of drawing, whether it be sketching or working on a larger piece. How much planning goes into your creative process? Sketching and experimenting with different media is very important to me. I may do several drawings of a character in different poses, or from different perspectives before I settle on what the final piece might look like. It’s not only about planning but sketching and playing around with ideas is a great way to warm up before committing to something. I’ll test colours, pens and brush marks in order to create different visual textures and patterns. I even keep my test sheets. They end up looking rather abstract, like little works of art in their own right. There is an element of trial and error, but that’s all part of the creative process. If you’re not having fun experimenting as an artist, you may end up stumped as to how to approach what you want to draw from the start. Despite this, there are sometimes magical moments when you can draw something immediately and know it’s working well. However, moments like that only come from practise and experience. Do you set self-imposed goals or deadlines along the way? Self-imposed goals or deadlines can work in one of two ways. They can either help to drive me forward, or they can have the reverse effect if I’m unable to meet that deadline. With the latter, it’s really just a matter of reassessing what I’m doing and whether it’s feasible to complete it within that timescale. The goal or deadline may have just been too unrealistic. The important thing is not to beat yourself up over it. With regards to getting ready for trading at conventions, it’s understandably important to prepare in good time. I’ll do a mock set up of my table and prepare in a way where I hopefully do not end up rushing. A diary and wall calendar certainly help to manage my time wisely. Sometimes there are things beyond your control and therefore self-imposed deadlines can’t be met. A prime example was with my Yōkai Art Challenge. I personally set myself a challenge to draw a Yōkai a day throughout February. I was going great guns until I developed a chest infection. Even when I felt well enough to resume, my lower back was causing me trouble, so sitting down to draw was painful and difficult at times. At times like that, you simply take things as they come and draw when you feel able to. In the end I was able to draw all 28 Yōkai, even if it took longer than expected. As this was a personally set art challenge, I wasn’t answerable to anybody else. You have to look after yourself and put your health first. Do you have any particular rituals that are necessary for your creative process? I adore listening to music as I draw. I usually find music can be quite inspirational and can help me “get into the zone”. I might listen to something frenetic or intense if I’m experimenting with lots of ink splatters or vigorous pen marks, or I might listen to something calm and rhythmic when there’s a lot of careful, fine detail involved. So one day I might be listening to Japanese speed metal whilst sketching a fierce beast, then the next day I might be listening to a soundtrack from a particular film or video game when working on some fan art. My tastes in music is very eclectic, so I have many genres ready to go if need be when getting creative. Do you have a specific location where you always work? I am very fortunate to have a dedicated space for creating my art. I have a spare room that’s basically my studio. It’s where I get most of my drawing done. I might open my window, light a candle or incense stick to make it feel welcoming. It’s a nice way to start when entering the room. When the weather is good I like to sit outside and draw in the garden, or visit a museum to do some observational sketches. Any favorite tools for your process? At this moment in time, my favourite art tools are my mechanical pencils and Pentel brush pen. Both are easy to use and readily available for when I just want to start drawing. Does social media help or hurt your creative process? In what ways? I feel I could spend a fair amount of time discussing this great question as I feel there’s no easy or definitive answer, and that’s merely down to the ever-changing nature of social media platforms. At times I can be ambivalent of social media, then I might be singing its praises, but this is purely based on my own experiences. Admittedly, it can be a distraction and you can end up losing your creative focus if you’re not careful, but with some self-control you learn to ignore checking the incoming notifications and new posts. That can all wait until I’ve finished drawing. Social media isn’t the be all and end all, but I do think that if it wasn’t for platforms such as Facebook, Twitter or Instagram, I wouldn’t be drawing and producing art the way I do now. I certainly wouldn’t be exhibiting at comic cons, selling my work or even meeting and greeting other fellow artists in person whom I discovered online. It really does open up your world to new possibilities. I wouldn’t even be doing this interview if it wasn’t for you (Michael) discovering my artwork on Twitter! Ultimately, I’m able to share my artwork with so many people and have an instant global audience. It still amazes me that people from around the world respond to and engage with my posts. I have discovered and connected with so many artists in a way that I never did before. Especially on Twitter, people can be so supportive and encouraging. I feel part of an online art community. Also, through following other amazing artists, from hobbyists to professionals, you learn from their posts and tweets the do’s and don’ts of social media, whether it be from hashtag usage to how best to photograph your artwork for sharing online. It can be time consuming and hard work at times managing your social media accounts, but it’s certainly worth it. You can discover so many opportunities that can really help you develop as an artist, if you know where and how to look for them. I always appreciate the comments and engagement I receive via Facebook, Twitter and Instagram. Sometimes I know I could be using these social media in a more advantageous way, but for now I’m just delighted that people are able to see my artwork! Who knows what it will lead to next. When you have a creative block or lull in your process, what are some things that help you get back on track? Monthly art challenges work best for me if I need to jump-start my creativity after a long hiatus, whether it’s a self-imposed one, or taking part in a well-known art challenge such as Inktober. If you know other fellow artists are taking part, you feel both supported and inspired, and it helps to motivate you to produce artwork again. I’m sure this is the case for all artists, but I often find myself daydreaming. I might imagine characters battling, co-existing, or interacting with each other and their environments. Music helps in a way that facilitates and ignites my imagination. It can form the soundtrack to all my visual imaginings. It’s good to put on some music and just start drawing, irrespective of how it turns out. It’s a good way just to relax and enjoy the process. I also find the best way to beat artist’s block is to just start drawing anyway. Even if you feel what you’ve drawn isn’t great, it still has potential. If I churn out lots of drawings that don’t feel quite right, I’m working through my artist’s block a drawing at a time. Sometimes it’s about perseverance, but at other times it might not be that straightforward. With the best will in the world, I may not be able to break through that creative block. When all else fails, it’s better to take a good step back and have a break. I try to switch off and do something enjoyable, then I’ll revisit drawing later on. I find going for a walk and getting some fresh air can very beneficial if a good break is needed. When is a piece of art “finished”? How do you know? I suppose it comes down to instinct and experience, but that all seems a bit vague. If I feel an illustration is finished, or is almost near completion, it’s important for me to put that illustration to one side and take a break. I’ll then revisit it and look at it from another angle, from a distance and under different light conditions. I also show it to others. They might notice something I haven’t. Then it’s just a matter of saying it’s done if no final touches are required. If you enjoyed this interview, feel free to like & comment below and share the interview link on social media! Issue No. 3 will be published on Wednesday, April 24th. See you then! Let's Talk Process with artist Ruth Welter!